Our 23 hotel rooms are situated in an extension which was added to our main house in 1992. Each room has been decorated lovingly and individually with chosen fabrics and high-end furnishings creating a cosy atmosphere. A high level of functionality is maintained by a flat screen TV, WIFI and insect screens on all windows. South-facing rooms are additionally equipped with sunscreens. 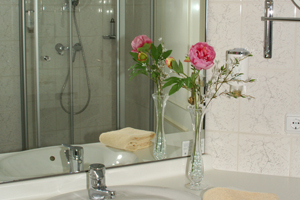 All rooms have an ensuite bathroom with a shower or bath tub, hairdryer and a makeup mirror. 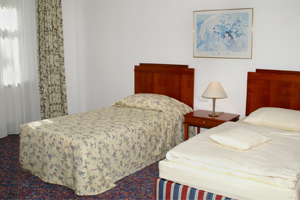 They are all non-smoking rooms which may be used as single, double or twin rooms. 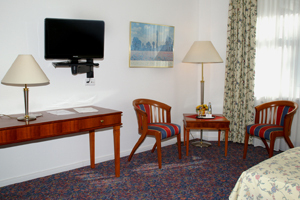 In addition to that we also offer two spacious junior suites with separate bathroom /WC. We offer sufficient parking space, barrier-free accessibility and an elevator. Prices include our rich and varied buffet breakfast.